M-Switch MIXER is a high-performance Message Switch, providing conversion between X.400 and Internet email according to the MIXER specifications. M-Switch MIXER: Unrestricted. Can be used in any scenario to support X.400/SMTP conversion and message delivery. M-Switch MIXER: Unrestricted can also be used as the messaging component of an ACP145 Gateway. M-Switch MIXER: Local. Can be used to connect a small number of users by protocol conversion (connecting to an SMTP network to support local X.400 users using direct P3 connection or indirect P7 connection, with X.400 P1 connectivity or connecting to an X.400 network using a single P1 connection to support a small number of SMTP users. Suitable for any situation where conversion between X.400 and Internet mail is needed, M-Switch MIXER's X.400 capabilities are based on based on M-Switch X.400 and its Internet Email capabilities are based on M-Switch SMTP, these products should be reviewed for X.400 and SMTP capabilities of M-Switch MIXER. Channels to convert between Internet and X.400 P2 according to MIXER rules are provided. Conversion of body parts is performed according to RFC 2157 (Mapping between X.400 and RFC-822/MIME Message Bodies) and RFC 1496 (Rules for Downgrading Messages from X.400/88 to X.400/84 When MIME Content-Types are Present in the Messages). Channels are provided for the conversion of the message body-part types of X.400 and those of MIME. M-Switch MIXER supports address translation using both encapsulated addressing and flexible address mapping using the standard MIXER address mapping mechanisms. Addresses are mapped algorithmically, with MIXER mappings relating part or all of the domain of an Internet email address to O, OUs, ADMD, PRMD and Country of X.400 OR Addresses. This provides a convenient way to algorithmically map addresses, usually resulting in addresses that are reasonable for human users. M-Switch MIXER provides a configurable option to use Common Name mappings instead of the MIXER preferred personal name. M-Switch MIXER supports mapping configured in a directory, and provides GUI configuration of the MIXER mappings. A typical MIXER gateway will define a small number of these mappings. M-Switch MIXER provides flexible configuration to map Importance: and various priority fields and MTS Grade of Delivery and internal M-Switch Priority are assigned according to RFC 6758. M-Switch MIXER extends this core mapping to provide mappings for individual user addresses configured in the directory. A directory entry will hold both Internet and X.400 addresses for a user, and will map between these. This has the benefit of providing a completely flexible mapping for a community of users, and can also utilize information that is already configured in the directory where users have access to both Internet mail and to X.400. There is flexible configuration for mapping in both directions. It is possible to use multiple directories; each handling different parts of the mail address space. The attributes used for the mappings are also configurable. This is important where a MIXER gateway supports multiple organizations, and there are existing directories for each organization holding the relevant information. SMTP DSNs (Delivery Status Notifications) are mapped with X.400 Delivery Reports. SMTP MDNs (Message Disposition Notifications) are mapped with X.400 IPNs (InterPersonal Notifications). File Transfer Body Part (FTBP) is an X.400 extension designed to handle transfer of generic information over X.400. The EMA Message Attachment Working Group (MAWG) has defined a specific mode of using FTBP and most X.400 client vendors have adopted this mechanism. The M-Switch supports this format, and enables conversion between this and the corresponding MIME functionality. This enables straightforward exchange of attachments, such as Microsoft Word documents, between Internet Mail and X.400 users. M-Switch MIXER can map X.400 messages to Internet, by wrapping the X.400 Content as a MIME Body Part according to the X400WRAP specification. This mapping is used by default for X.400 messages which are not InterPersonal Messages, including Military P772 Messages. MIXER as specified in RFC 2156 does not include any security mappings, as in general mapping of protocol dependent security features does not make sense. M-Switch supports the S/MIME encoding of Secure Internet Messages (RFC 3851). When messages are received from Internet Email in S/MIME format, S/MIME signatures are verified. This ensures content integrity and originator authentication to the MIXER gateway. Where S/MIME messages are not encrypted, the S/MIME encoding may be stripped and then a standard MIXER mapping is applied. This will map the message to X.400 without S/MIME encoding, which most X.400 clients would not be able to handle. When mapping from X.400 to Internet Mail, messages may be S/MIME encoded and signed by the gateway. This will provide content integrity and authentication between the MIXER gateway and the Internet Mail recipient. M-Switch MIXER provides support for structured Security Labels and ad hoc Security Labels. Structured Security Labels can be carried with X.400 messages, as "X.411 labels" in the message envelope. Structured Security labels can be carried with Internet messages, as "ESS labels" within a S/MIME message as defined in RFC 2634 "Enhanced Security Services for S/MIME". ESS labels and X.411 labels are similar ASN.1 encoded labels. M-Switch MIXER maps between X.411 and ESS Security Labels. Coming from Internet Mail this is done by extracting the ESS Label and the MIME message from the S/MIME encoding, mapping the label encoding and then sending it as an X.411 label. S/MIME signature verification is also done. Coming from X.400, the reverse happens, mapping an X.411 label to an ESS label wrapped in S/MIME, with the S/MIME signed by the MIXER gateway. M-Switch MIXER can also provide mappings to FLOT (First Line of Text) and other ad hoc security label format. There is flexible support for a variety of labels in Internet messages which is described in detail in M-Switch SMTP. FLOT labels are also supported on the X.400 side. M-Switch MIXER can map between structured Security Labels and ad hoc Security Labels in both directions. For more information see [Security Label Capabilities in M-Switch]. Mapping between the MMHS over SMTP headers and STANAG 4406 Headers. Mapping STANAG 4406 with the MMHS-Authorizing-Users as defined in "Draft and Release using Internet Email". National variants on the STANAG 4406 (and ACP123) specifications have led to a situation where interoperability between national MMHS systems is not guaranteed. ACP145 has been defined in order to overcome this problem, and is a complete protocol definition for international inter-working. The ACP145 specification has led to a requirement for ACP145 Gateways, which convert between the national variants of MMHS and ACP145. M-Switch MIXER can be deployed as an ACP145 Gateway, including support for Security Labels and Message Digital Signatures. M-Switch MIXER, deployed as part of an ACP145 Gateway can also enable a national network using SMTP and S/MIME to be connected using ACP145. The ACP145 specification requires the use of an ACP133 Military Directory, such as M-Vault. Further details in the Isode whitepaper [ACP145: Isode Support of International MMHS Gateways]. 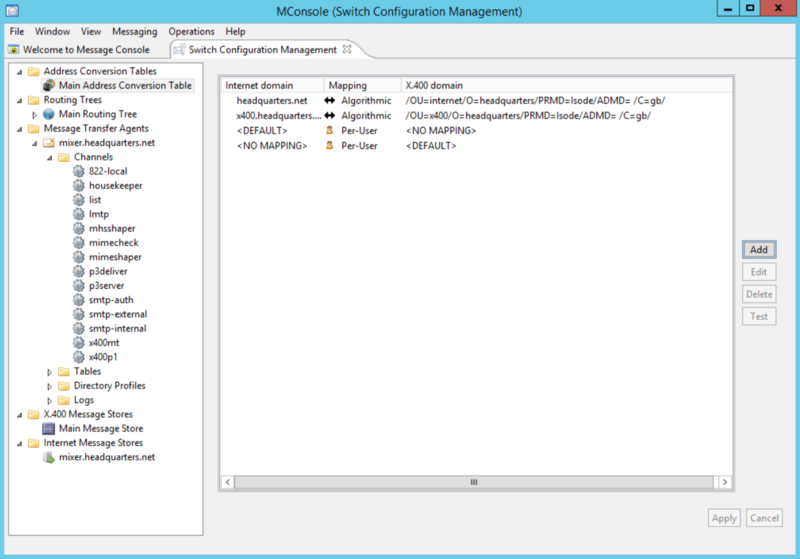 Isode's MConsole GUI tool is used for configuration and management of M-Switch MIXER. The screenshot below shows a MIXER (X.400/SMTP Gateway) setup. The address conversion tree is set up for standard MIXER mappings. The configuration pane shows how a number of MIXER mapping options can be set up. In addition to the open standards supported by M-Switch SMTP and M-Switch X.400, M-Switch MIXER conforms to the following Open Standards.